I’ve been wandering on RealTimeVFX for a while now but never got to actually post, so here I am ! I started self learning Game Dev in general a couple months ago full time, and recently fully branched in VFX, trying to hone my skills and constitute a portfolio. I’m looking for advice and criticism on one of the pieces I’m the most proud of to this date to improve and constitute a better portfolio. I’m at the point where I feel comfortable with sharing what I have and want to get to the next step. I created this Fiery Beam effect in Unity. Textures were made in Aftereffects and Photoshop, and I used Blender for the few meshes. The Beam itself is a Line effect animated with Timeline. 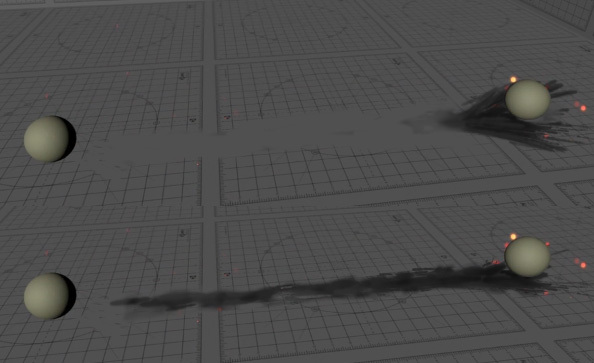 The hit effect is a combination of a cone mesh with a scrolling voronoi and a counter flowing simple noise, with some trails. I like the rectangles in the the beam, and around the firing point. you could give them more motion. I don’t really care for the expanding ring. maybe replace it with slightly larger squares that have some rotation as the fly away. may look better if the rectangles had sharper edges. that will make it look more techy, and less fiery though so depends on what you’re going for. maybe don’t fade out the rectangles at all, just scale them to zero. I don’t know if you’re scaling or using a gradient erosion to create the stretch effect? I think the stretching of the rectangles looks alright during the charge up, but then when the blast starts and they are blasted forward in that cone spray I think they would look better if they weren’t stretched. i’d just scale them to 0 with the same rate on the x and y.
anyway those are just my two cent’s. overall the effect does look good, just a matter of tweaking little things here and there to make it look great. It might not be directly related to the effect, but I would tone down that background texture, since it’s giving me that “grid illusion” feel and it feels a bit dizzy. Also, maybe move the camera a bit closer to the subjects, since I feel the empty space might be distracting, the eyes move towards the background texture and such. In terms of the effect, I second what @Cel just said! Thanks a lot for the feedback ! It really helps ! @Cel I agree the ring did not capture what I was looking for ! I’ll try and tweak rectangles and work more on the theme overall. I’ll try the scale it sounds promising. Now that you point it out these blast sparks feel a bit dull I agree. @Lush That’s the kind of thing I don’t see working with it all day ! I’ll try a better scene config, that really helps ! You want something that isn’t contrasty or detailed. Indeed, he is using the Unity Shader Calibration Scene background. You can download it on the Unity Asset Store for free. Oh great ! I ignored it was a standard thing ! I’ve never been satisfied with the background anyway, I found it hard to find something neutral to work on. I’ve updated the effect making use of the comments I got before. The background helps a lot ! Thanks to everyone who pointed it out ! I tried the sparks in rectangles, more blocky shapes, but in the end a capsule shape felt the best. Shortened the effect overall, especially the beam’s lifetime. The circle spinning is nice, but it lost the explosiveness it had before. Overall I prefer it now. I changed all the particles that came with the beam to shrink rather than fade as suggested and that was a big upgrade. Did some small other changes and addons. If anyone has more suggestions I’ll take all the help I can get ! you could just leave the scorch mark on the ground if you want. In a game you would fade it out, but it doesn’t really look natural since scorch marks don’t do that in the real world. And since this is probably for a vfx reel you want to move from one effect to the next fairly quickly and the effect is faster if you don’t have to wait for it to fade. if you can figure out a way to make the sparks feel more like they landed on the ground that be good. maybe give them some bounce or maybe use velocity aligned? not really sure. maybe look around for some snow particle tutorials and do that. The scorch mark looks like the shadow cast by the balls and beam, maybe have it be only around the target? Speaking of shadows, maybe have the balls cast shadows on to the ground to help ground them a bit. Since you have particles landing on the ground, the spheres casting shadows would help clarify the spatial relationships. Thanks a lot to both of you ! I’ll get working of these ideas ! I’m looking to add more shadows, ground glows. the conical marks at the end seem like a really good idea.